"The Bandstand on Wakefield's lower Common was built in 1885 in response to a national beautification movement to raise standards for architecture and public space in America. It was built as part of the $10,000 Cornelius Sweetser bequest which provided money for park purposes. The newly formed park commission purchased two lots of land between the lake and Main Street (owned by heirs of John White and Thomas Emerson) for $2,000 and $1,800 respectively, and work on the park began under the direction of Ernest W. Bowditch of Boston. A total of $13,830.23 was expended to complete the extensive work at the park, of which the bandstand was a part. Known as the 'Park Music Pavilion' and 'The Pagoda', the bandstand is said to resemble a pavilion in Brighton England, although its turned posts and ornamental frieze are also of the Queen Anne-style. The structure is made if wood and dressed fieldstone and its dome top was painted 'in the color of the heart's blood of the indulgent taxpayer.' The bandstand was recently restored by the Wakefield Center Neighborhood Association." -- Text from calendar by Jayne M. D'Onofrio. 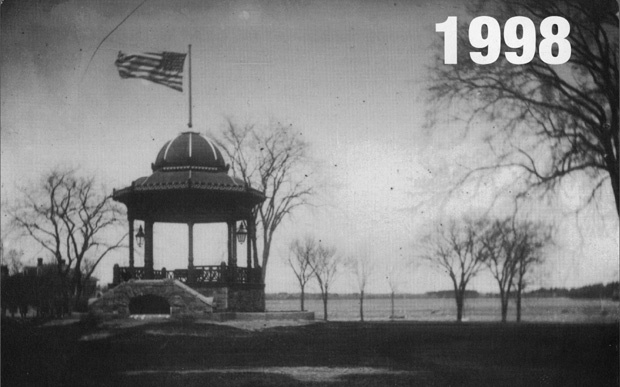 “Bandstand, circa 1895,” NOBLE Digital Heritage, accessed April 22, 2019, https://digitalheritage.noblenet.org/noble/items/show/6868.